Decoupage is an art that has been around for centuries and has become very popular in card making. It can produce some spectacular effects. The word is from the French verb decouper - to cut out. It is the layering of cut out images, to produce an effect that looks as if it is raised from the card. Ordinary wall paper can be used to decoupage picture frames or mirrors, photo albums, ceramics. Scrapbook pages and cards. Shop bought items, like clocks, can often be treated to a makeover very successfully. You won't be surprised to find that many household materials where used to create these effects. Once you found the item you wanted to decorate you just need to gather a few things commonly found in the home. Scissors, glue, sponge, craft knife. Special pointed scissors can now be purchased and these enable you to cut out finer details from the image. Things like leaves or around petals. The pictures were often collected from newspapers, magazines, books. Even photographs can be used successfully. The effect is created by using ever smaller layers of your chosen image and mounting it onto foam pads, or with silicone to give the rise. This will give a 3-D effect and can be very beautiful. Diecut images are the easiest form to use. They are especially good for people who can't handle scissors, because of arthritis maybe. Or perhaps you are like me and hate the fiddly cutting out. The diecuts are numbered so that you will know which piece goes where. But a good tip is to pencil the number on the back of each piece so that you won't forget. Another way to get the result you want is to use rubber stamps. All you need to do is stamp the image out several times, colour them, and then build out to the smallest piece. Use different areas of it and build it up with as many layers as you desire. 3 to 5 layers will produce a lovely effect. 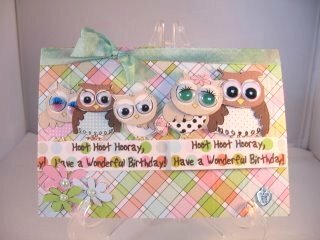 Again another fabulous way to create a spectacular card that you would be proud to give. And the recipient would be delighted to recieve. 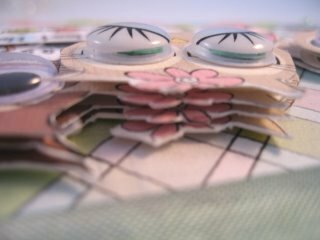 But remember this technique can be used in many ways and not just in your cardmaking. Return from Decoupage to Homepage.